Scia-what? : Research Corporation for Science Advancement apparently wants to give away money (grants, in their Scialog 2009: Solar Energy Conversion program.) Why they choose to advertise in the jobs section is beyond me. Small college of the week: University of Massachusetts at Dartmouth (North Dartmouth, Mass, student population: 9155) is looking for lecturers! If you have a specialty in inorganic chemistry, analytical chemistry, bio-inorganic chemistry and chemical education, these positions may be for you! Including June 25, there have been 9 new jobs posted on the ACS Careers website. Sanford and things: Invista is looking for a B.S. chemist with a organic/polymer background; 0-5 years experience in organic synthesis desired. Looks good to me. It's in South Carolina, which (as a state) has been suffering of late, especially between Miss Teen SC, the economy and the soon-to-be-departed governor. Bet the BBQ is good. Honk if you got a p-chem degree: A small medical devices company is looking for a Ph.D. physical chemist to help with designing glucose monitors. Interesting and tempting -- no experience requirements posted. Interesting H.S. job: Bard College has started an "early college" program, where at the end of it, you get an Associate of Arts and your Regents diploma. Interestingly, they're looking for a Ph.D. organic chemist with lots of teaching experience. So if you want to teach organic to teenagers (and who wouldn't? what a challenge! ), this might be for you. Since June 21, there have been 17 new jobs posted on the ACS Careers database. Babysitting or chemistry teaching? : I have always been a little uncomfortable with the idea of teaching high school with my chemistry degree, but there are those I've talked to who love it. Fairmont Private Schools is "the largest private high school in Orange County (CA)" -- they're looking for a chemistry teacher, preferably one with experience teaching in high school. Hmmm. If they only knew...: Washington State University has a remarkable place called the "Institute for Shock Physics"; they study materials at extreme conditions. There's a opening for a computational postdoc in "high pressure science", which must be a pun on the part of the titler. They want a recent Ph.D. in physical chemistry. Multicultural, anyone? : Tetranov International is a startup CRO in pharmaceutical synthesis -- they have 3 openings for B.S. synthetic chemists. I'm quite fond of the mangled Engrish that you occasionally see in ACS Careers postings. They title the ad "Synthetic Research Scientists", which sounds like a bunch of artifically created lab robots and they apparently prefer chemists with experience in something called "medichem", which I suspect is performed in pharma discovery labs. Sigh. These are positions in the US, but the company has sites in the US and China, even though they have a Russian-sounding name. Fascinating. The Christensen article in yesterday's LA Times introduced a number of new facts into the public record about this case; some of these facts appear to be from the family's conversations with Sheri Sangji. They are as follows: 1) questions about the scale, 2) the contribution of hexanes to Ms. Sangji's injuries and 3) allegations of tampering with the lab after the accident. Sangji's letter also alleges that the investigator ignored key information she relayed to him from her critically burned sister, including that she had made three transfers each of 50 milliliters, or about 1.7 ounces. The investigator's report, obtained through a California Public Records Act request, put the volume of t-butyl lithium at 20 milliliters... The family also contends that the investigator ignored a UCLA fire marshal's report, which quoted Harran as saying that Sangji probably was transferring 40 to 50 milliliters of the chemical and that a different method would have been preferred for that amount. All right, what gives? The scale from before was 20 mL of 1.7M tBuLi in pentane, which I've pointed out previously, is a pretty big amount of tert-butyllithium for an academic lab for one reaction. If the reports of the UCLA fire marshal's investigation and Harran's statement are true, the new amounts are quite large. Moreover, the family's amount (150 mL) is stunning. Let's use the calculations I did last time (2.0 equiv tBuLi (assuming lithium-halogen exchange), MW 250). Now we're talking about either 8.5 to 10.6 grams (Harran's speculation) or 31.9 grams starting material (Sangji family statement). Not to repeat myself, but it's becoming quite clear to me that Ms. Sangji was performing a scale-up, where she was repeating previous work done on smaller amounts. Even in more experienced hands, this would have cried out for extreme levels of caution. On this scale (40-150 mL), cannulation would have been far preferable -- and would have required that much more supervision, as it is a much more tricky technique. The investigator also failed to take into account UCLA fire officials' initial concerns that the accident scene had been tampered with, Sangji's letter says. On the night of the fire, a deputy fire marshal had ordered Harran and his researchers to stay out of the lab, which was then locked and secured with plastic crime-scene tape, records show. But the next morning, the deputy reported, he found that some 5-gallon drums of improperly stored flammable liquids were gone, and other items had been moved around. There also was no sign of a container of highly flammable hexane that Sheri Sangji said had spilled and fueled the flash fire that engulfed her, according to a report by Los Angeles fire officials who interviewed her shortly afterward. When UCLA fire officials interviewed Harran on Feb. 5, he said he knew nothing about the hexane. He acknowledged asking two researchers to clean up the lab and remove the drums, but said he had no ulterior motive. "I just wanted to get all those drums out," he said. "It was my fault. . . . And it didn't relate to the accident, but it just looked bad." The suspected tampering triggered a criminal investigation by UCLA police, who concluded in January that no crime had been committed, records show. Cal-OSHA's Bureau of Investigation has launched its own probe, as it routinely does in death cases, to determine if there is evidence of a crime. Fryer would say only that it is ongoing. Hexanes in the hood: Of all the new facts introduced, I find this one the most believable. Typical organic chemists split their hoods in two, mentally and physically: one side for reaction running, another for reaction workup and purification. It is entirely unsurprising if a open container of hexanes was located nearby (for a flash column) and were to have caught on fire. Whether it actually did or not is something that I cannot answer -- however, the possibility of such a container being present is entirely reasonable. *I am sympathetic to the thought that Professor Harran was not in a proper state of mind when he suggested this course of action. Impulses to cover up your mistakes are pretty natural, really. Acting on them, though, is a different matter. But the academic science community thrives best on openness and frank discussion. In that vein and with a nod towards full disclosure of the details of the accident, I respectfully call for the publication of the notebook page of the fatal reaction. This is the only scientific (and legal!) document that can fully explain what Sheri Sangji was attempting to do that day. 1. A report by the California Fatality Assessment and Control Program, which is a unit of the National Institute for Occupational Health and Safety. In my opinion, it is the most rational, factual and professional (possibly only?) safety analysis of the case released to date. New fact: Sheri Sangji was using a 20 gauge 2-inch needle on the 60 mL syringe used for the transfer. 2. Jyllian Kemsley continues to ably cover the case from her perch at C&E News. Her article neatly summarizes UCLA's attempt to appeal the findings of Cal/OSHA in order to avoid future legal liability. Among the relevant facts in Ms. Kemsley's article: both the family and the union for lab techs are trying to influence the appeal. Union representatives have done walkthroughs of the chemistry labs in May and there are still folks not wearing lab coats in the labs. The family has not yet filed a lawsuit, but wishes for the District Attorney to investigate. 3. Kim Christensen of the Los Angeles Times further covers the family's objections to the state's investigation and fines of UCLA. The article introduces a number of facts into the public realm that will be covered in the next post: speculation as to the scale of the reaction (ranging from 20-150 (! )mL), hexanes that may have caused further injury to Ms. Sangji and finally, suspicions of tampering with the lab after the accident. Since June 19, there have been 15 jobs posted on the ACS Careers database. But what if I don't want to go to China? : Of the 15 job ads posted on June 21, 13 were located in Shanghai, China. Shanghai ChemPartners and Wuxi AppTec have posted multiple positions, including the mysterious "QB head", which requires a Ph.D. in the biological sciences who has lots of assay experience. Unknown as to whether the position also requires a square Peyton Manning-like jaw. Here it comes! : I predict a deluge of applications for the 2 medchem jobs posted by Proteostasis Therapeutics, Inc. and Genentech. Both Ph.D. positions, 0-2 years of postdoc and 2-5 years industrial experience, respectively. Good luck out there. Hmmm: Not much for the working non-Ph.D. chemist (i.e. the folks who do the real work) these days. Sigh. Top Gun rules are not flexible, nor am I: Sorry -- whenever I think of the Navy, I can't help but quote that movie. The United States Naval Academy is looking for two post-docs to do molecular dynamics calculations on solid lubricants. I had no idea that USNA hired p-chem postdocs -- I think that's great. The opportunity to teach midshipmen would be a privilege as well, I would think. Saginaw? Really? : Dow Corning has posted a senior process chemist position, for a Ph.D. materials science-type with semiconductor experience. I'm glad to see that there are some technical jobs left in Michigan, which is one of the country's loveliest states. Want to see the world? : If you have a Ph.D. in synthetic organic chemistry with a postdoc, you may be interested in this position in beautiful and warm Hyderabad, India working for DuPont. That's right, you too can be paid in rupees for doing chemistry in crop protection science. I like how they note that you'll be working "closely" with the Delaware folks -- what's that mean exactly? Like you'll be doing the teleconference equivalent of getting them coffee? Caveats and explanation: The Daily Pump Trap is a blogging of the interesting jobs that come across the ACS Careers website. It is not a complete accounting of the jobs that are published there, just the ones I find interesting or amusing or worthwhile. Registration is required for the ACS job database -- I know, I know -- I'm sorry if you don't have access. Then again, e-mail me if that's an issue and I'll try to see what I can do for you personally (within reason, of course). Since June 15, there have been 12 positions posted on the ACS Careers jobs database. Chemists, we'll make you Army Strong: The Army Research Laboratory is looking for a Ph.D. in "biology, microbiology, chemistry, physics or engineering or equivalent experience, with substantial background and experience in related research" to work on sensor systems for warfighters. Interesting -- looks like it's entry-level -- good news! Monoclonals and sand and surf...: The lengthily named "Agensys, Inc., A subsidiary of Astellas Pharma" is looking for a B.S. biochemist with experience in recombinant protein purification. Sounds like a winner of a job, especially the Santa Monica location. Polymer chemistry experience? : DIAB is a company that manufactures (among other things) foam -- if you're a B.S. chemist with 3 years of related experience in polymer chemistry, this position in DeSoto, TX may be for you. Hmmmmmm -- are MBAs evil? What do evil MBAs do? Chemjobber friend OA wants to know: "do you think going for an industrial PhD (or even a traditional PhD for comparison) would help an industrial career in longevity/advancement vs. sticking with the MS as the highest degree? I'm also recently toying with the idea of joining the dark side and getting a MBA based on seeing all the postings for "six sigma black belts" while trying to find another nonexistent bench job." Readers, only you know. What do you think? Are chemistry/MBA types the spawn of the devil or just minor demons in the pit of hell? %$%#$@%#$%: No industry jobs advertised this week. Yes, I counted the ACS positions; no, they don't count. Unless you have a Ph.D. with either 7+ or 16+ years experience, that is. Stimulus money at work? : The Center for Molecular Electrocatalysis at Pacific Northwest National Laboratories is looking for research scientists with experience with organometallic or inorganic synthesis. Exciting! Eastern Washington is actually quite a beautiful place, in that spare sense. Small college of the week: The University of Fribourg (Fribourg, Switzerland, student population: 10,000, SA-LUTE) is looking for a professor of organometallic chemistry. Fribourg sounds lovely -- and it sounds like you can learn both French and German there! Since June 13, there have been 8 jobs published on the ACS Careers website. Thanks, Vertex: Vertex, unlike some pharmas, has been relatively active during the Great Whatever of 2007-9. Interestingly, they keep posting these ads for Scientists in "Chemical Development", which appears to be their process chemistry division. I imagine that this is the new new in terms of process chemistry jobs: "Experience interacting with contract research (CRO) and contract manufacturing (CMO) organizations." Outsourcing -- what can't it do? Stimulus dollars at work (con't): The National Renewable Energy Laboratory is looking for a Senior Engineer I in Solar Energy. Sounds good to me -- you'll be directing projects developing solar energy resources. And when you get bored of work, you can hop on over to the Coors facility for a cold one! Important Big Pharma job: Biogen Idec wants a process safety coordinator. Looks to be a good solid B.S. chemist job, although I haven't clicked through to find out the degree requirements. PET postdoc at Johns Hopkins: While it's my understanding that Baltimore is not a nice place to live, Johns Hopkins is one of the foremost medical schools in the country. They're looking for a postdoc in what I imagine to be synthetic radiochemistry (PET imaging, that sort of thing. Everything I've heard is that this area is looking for synthetic chemists. Stimulus dollars at work? : Savannah River National Laboratories continues its push to hire all the scientists it can. 6 positions in the last three days. Interesting, but odd: A company called "Green Earth Technologies" is looking to hire directors in R&D to "to enhance the performance of biodegradable consumer products. Develop green additives for motor oils, fuels & lubricants." Dude -- if it's in motor oil, it ain't not green. Really. Really, Pfizer, really? Pfizer has been advertising this high-level "oligonucleotide chemist " position in Cambridge for about a year now. It's driving me crazy because it shows up for damn near every single "synthetic chemist" job search out there. Look -- you've already spent like five grand on the advertising by now. Why not just send $100 bouquets/gift baskets to the undoubtedly less than fifty chemists who fit your criteria? It'd be cheaper and probably more effective. So that's what ADM is doing with those federal subsidies! : Did you know there's a National Corn-to-Ethanol Research Center? You do now! (Really -- what's to research? Snerk. Sorry, sorry.) They're looking for postdocs, in case you were interested in spending time in southern Illinois. Spam FTW! : Hormel Foods is looking for a "Associate Quality & Process Control Supervisor " to keep the nation's supply for Spam safe from bacteria, accidents and terrorist attack (joking on that last.) They'd like you to have a food science degree with a minimum 2.70 GPA. Wait -- you mean my 2.60 GPA* doesn't count. Oh, well. *Again, kidding. It was more like 2.65. 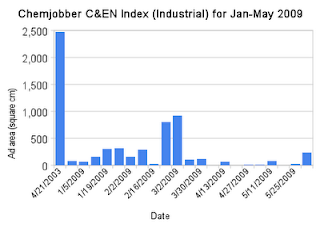 Note the huge bar on the far left, which is the measured Index for a single issue of C&EN five years ago (4/21/03). You can see the tabulated data here. Sigh: One very lovely ad from Scynexis, but only for a chemist with experience (analytical, more than 5 years of industrial time.) While I'm counting the ACS position as industrial, it might as well not be there. Unlikely ACS will hire some smart postdoc to administer the venerable Petroleum Research Fund. Nice work if you can get it: St. Jude Children's Research Hospital is looking for a staff position to run a med-chem lab in oncology and parasitology. This looks like a really lovely position for a laid-off Big Pharma-type. Life in Memphis is probably languid and lovely; the barbecue alone would be worth the salary cut. Would you be subjected to hours and hours of their heart-tugging and slightly annoying commercials during your orientation? Wanna find out? Small college of the week: The University of Western Australia (Perth, Western Australia, student population: 15, 920, SA-LUTE!) is looking for a "Chevron Professor of Gas Process Engineering"; this position also appears to be referred to as a "Winthrop Professor", which appears to be the very highest level of professor at UWA. Perth seems like a nice place -- you would be near the Perth Mint, which holds near as much gold as Fort Knox. Beryl Lieff Benderly is apparently a science writer of some repute; she writes the "Taken for Granted" column of ScienceCareers. While most of her work seems pretty harmless, her recent article on the Science Careers website about the UCLA / Sheri Sangji case was published (in slightly different form) on Slate, where it has gotten a few diggs and a raft of comments in "The Fray", Slate's discussion forum. A few days after Christmas of 2008, a young technician in a biochemistry laboratory at the University of California-Los Angeles began to transfer a tablespoon of t-butyl lithium from one container to another. T-butyl lithium is pyrophoric, meaning it ignites on contact with air, but Sheri Sangji wasn't wearing a protective lab coat—instead, she had on a flammable synthetic sweatshirt. Somehow the stuff spilled onto her clothing, and she was engulfed in flames. Sangji died from her burns 18 days later, and UCLA officials bemoaned the "tragic accident" that killed her. Sheri Sangji was practicing synthetic organic chemistry in Professor Patrick Harran's lab; Professor Harran is a prominent chemistry professor, not a biochemist. tert-butyl lithium would never be used for biochemistry procedures, a fact that seems to have escaped Ms. Benderly. Her writing strongly suggests that Ms. Sangji was literally using a tablespoon to perform the transfer. While 20 mL is indeed close to a tablespoon of material, the fact is that Sheri Sangji was using a 60 mL syringe with nitrogen pressure. Her writing mischaracterizes and trivializes the skill required and the danger involved in the transfer procedure she was doing. She also seems to be suggesting that Ms. Sangji was doing this during some sort of inventory procedure, whereas she was actually attempting to perform a chemical reaction. Later in the article, Ms. Benderly characterizes Ms. Sangji's death as the result of a "chemical spill", which again brings to mind the incorrect notion that her death was a result of exposure to a toxic compound, not fire. Even the headline ("Explosions in the Lab") and subhed ("What can be learned from the death of a young biochemist at UCLA?") are wrong. * There's no evidence there was an explosion (although there was clearly a fire) and again, Sheri Sangji was not a biochemist. *I'll note that I'm holding my fire about the stupid picture of the dude with the tie holding the test tube of food coloring and water. Why is academia less safe than industry? It's the students, stupid: Here are the things that Ms. Benderly blames for academia's poor safety record: Cal/OSHA's lack of oversight over students, federal funding agencies, powerless EH&S offices and PIs. She misses the forest for the trees. While all of these contribute to the problem, there is a single problem that encompasses all of them: every few years, the best-trained lab workers leave in a process called "graduation" or "getting a real job." Why is academia inherently less safe than industry? Three words: experience, experience, experience. In the typical academic lab, the average age of the workers is in their mid-20's. In the typical industrial lab, the average age is somewhere north of 30 or so. Let's look at this differently: how many years had Sheri Sangji been working in an organic chemistry lab? I'll make a rudimentary and generous guess -- somewhere around 2-3 years. (I'm guessing this is way high, even with her two published papers.) What is the average experience level in a typical grad school-level lab? Probably 5-6 years (counting undergrad research, summers in the lab, time in grad school.) What's the typical level of experience in an industrial environment? In the lab I used to work in (big pharma), it was at least 10 years (undergrad, grad and work experience) and probably more. Uh, yeah, that'll work: What does Ms. Benderly prescribe? That "NIH and NSF should insist - on pain of dismissal, like the chemical companies - that researchers follow all accepted safety procedures", that PIs and funding agencies cannot "ever again tolerate the risk of harm to lab workers", and that the provost on down must make safety "a requirement for career advancement and hiring... and tenure(!)" and last (but not least! ), that funding agencies must make "a good safety record and evidence of safety awareness real conditions for getting and keeping grants." Another big sigh -- some of this is really naive and some of this is weapons-grade nonsense. First of all, NIH and NSF cannot reach down into university labs and kick out that Bangladeshi postdoc who insists on running columns without lab glasses and side shields on. They don't do firing decisions at that level, nor do I think it practical to do so. Zero tolerance? Yeah, that'll work -- just ask Derek Lowe. It's the last two suggestions that are really bad: that tenure and grants be awarded on the basis of a "good safety record". A "good safety record" is hard to detect -- the absence of a bad one is far, far easier to find or fake. If such a system were to be implemented, what would happen? That's right -- the PIs and graduate students now have strong financial incentives to keep sweeping near misses, close calls and outright accidents under the rug. Hell, profs would buy a bigger broom, if it meant keeping their jobs, grants and promotions! Triple sigh: There's real work to be done to revolutionize lab safety in academic chemistry. There's a long-form article to be written on the Sheri Sangji case that will shed light on what happened that day (Kim Christensen has written most of it.) There's an investigation that should happen into the incident, by a government agency with real subpoena power. There's good commentary to be made. This article by Beryl Lieff Benderly is none of those things. I am very surprised to note that Chemjobber's commentary on the first LA Times article on the UCLA/Sangji case was nominated for 3quarksdaily 's blog writing prize. I sincerely doubt I'll make it to the Pinker level (it really IS just an honor to be nominated), but if you feel like scrolling, go vote here! Where are my freakin' green shoots? : No industrial jobs in the US! Don't forget the super-duper tempting positions in Mumbai working for "Asian Paints LTD."
Dude, where's my professorship? : While we're at it, there are 3, count 'em, only 3 employment ads in the issue this week. Every time I think there's a bottom to the job suckitude, I'm wrong. Small college of the week: Lycoming College (Williamsport, PA, student population: 1,485 - SA-LUTE!) is looking for a one-year temporary appointment teaching general and physical chemistry to non-majors. If you're looking to tune up your teaching skills ('Atoms for Artists', anyone? ), this position might be for you.